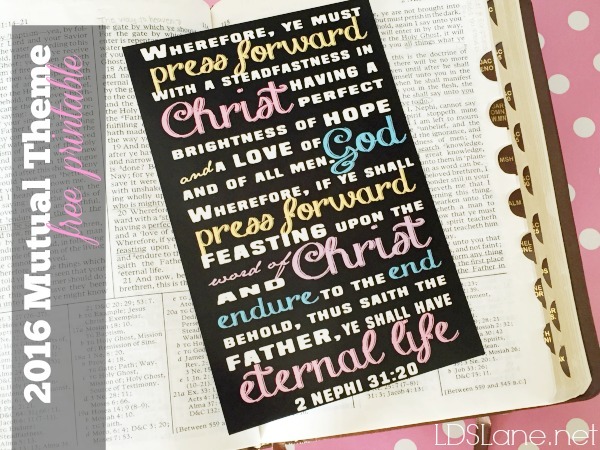 My mom just got put in the Young Women's Presidency in her ward and asked me to print her a 20" x 30" poster of the 2016 Mutual Theme: 2 Nephi 31:20. I was more than happy to help her out, then she said, "Great! 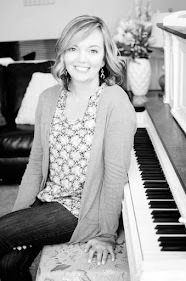 I will send you over a cute printable I bought." To which I responded, "You know Kari and I actually create printables for our blog followers?" Not wanting to burden me with making her a special design from scratch, she was perfectly content with me just printing off the one she found. I didn't even open the emailed pictured; instead, I went about creating my own 2016 Mutual Theme Scripture. I then had it printed poster-size at SAMs Club for $10. The next morning before taking the kids to school (and getting ready to attend the temple), I had my son snap a picture of the end result. Then, thanks to modern digital technology, I sent her the picture. She LOVED it. I'm was pretty fond of the final outcome too! She loved it so much that she asked if I wouldn't mind making the Young Women's Theme to match. 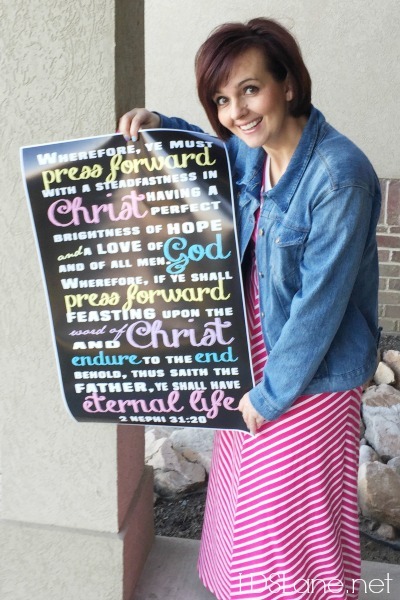 Her intent is to put one poster on either side of the chalkboard where the youth meet. 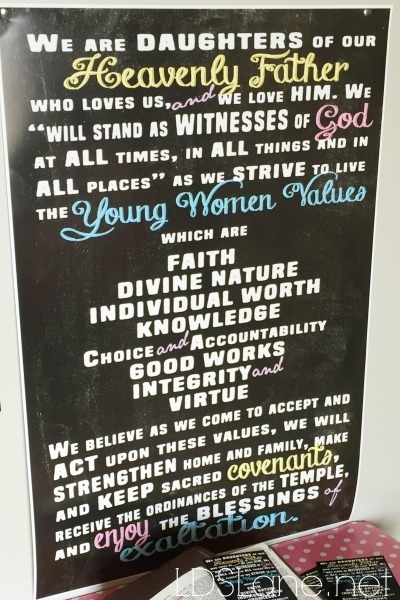 So, because I don't say no to my mom, I made a matching Young Women's Theme and printed it the exact same size as the other poster: 20" x 30". I love how these posters turned out. Most the time I am fearful to get an order back from the printer; I always wonder if the end result will match the one I created in my head. SAMs Club did not disappoint. 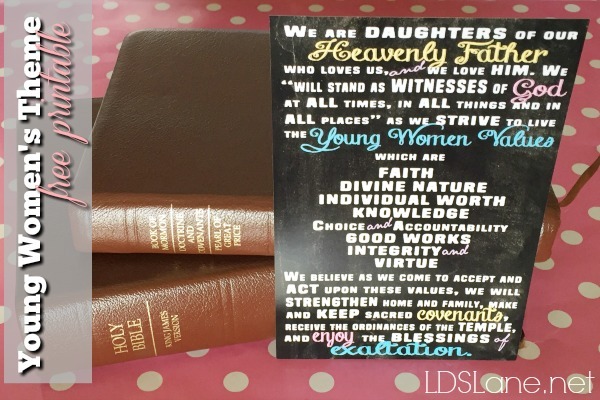 We also printed them 4 x 6 so the girls could put them in their scriptures. Seriously, you guys, I was so thrilled with how everything turned out that I almost wished I had a YW calling. 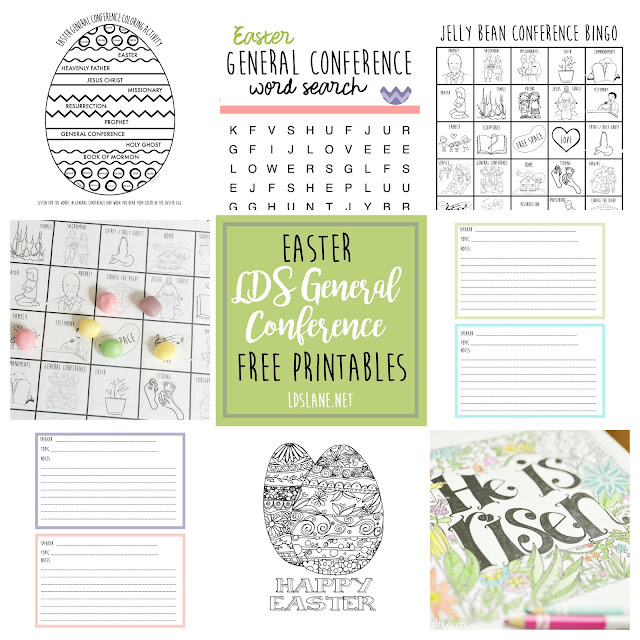 ;) I am so excited to share these free printables with you. To download the files simply click on the links below. I work with your mom in YW. It looks so great on our bulletin board!!! Thanks for creating it! Thank you so so so much for sharing these - I've been a Beehive Advisor for the last 6 years and our ward boundaries just got changed, so I've got girls graduating and leaving all over the place! I really wanted to give them something special as a goodbye gift, but I have zero budget. But when I came across your cute pages on Pinterest, I decided that printing a little coloring book/journal thing for them would be just perfect. I can't thank you enough.